Table tennis sometimes called ‘Ping Pong’, is said to have come about towards the latter half of the 19th century when it became quite popular amongst the British aristocracy who would often play a variation of it on the dining hall table after dinner. It was seen more as an after dinner leisure activity than considered a sport until around 1926, when after several attempts were made to have it formally recognised, the International Table Tennis Federation (ITTF) was formed and London hosted the first World Championships that same year. Today, it has evolved into a world renowned Olympic sporting event which attracts players from all over the globe, although it is especially popular in Asian countries and, in particular China. 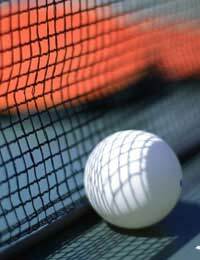 The sport takes place on a table which is divided by a net. Just as in tennis, you can play singles or doubles matches so 2 or 4 players can participate. Unlike tennis, however, the ball must be allowed to bounce once on your opponent’s side of the table before they can return a shot – in other words, there are no volleys allowed in table tennis. A player scores a point by forcing an opponent to return their shot into the net or if the player cannot return the ball at all or his return does not bounce once on the opposing side of the net. The first player to reach 11 points wins the set and there are five sets to each match. Many people who have never seen a proper competitive game of table tennis being played will not understand just how much skill and levels of fitness are involved. The sport is played at a breakneck speed and it’s often difficult to see the ball being batted back and forth as players hit it so hard and so fast. To play competitively, you need incredibly good hand/eye co-ordination and because players can put so much spin on the ball and hit it with such force, it’s not simply a case of standing in one spot and hitting the ball back gently so, when playing seriously and at a decent level of competition, you also need to be physically fit and able to run from side to side and back and forth and switch direction with barely a moment’s notice to think about it. In other words, it’s nothing like the kind of game you might have seen played on holiday at your hotel! You have to have very quick reactions as well as being a ‘master’ with the bat or paddle as it’s often referred to. Anticipating your opponent’s shot is also important as the incredible amount of spin that can be imparted on the ball can make it very difficult to predict where it’s going to go or how it will react when you try to hit it back. Therefore, being a ‘master of disguise’ in your shot making is also a useful skill to have in your repertoire. Overdoing it in training or competition can cause conditions like tendonitis in the shoulder or inflammation in your elbow area often referred to as ‘tennis elbow’. Good stretching exercises both before and after playing can help but if not, it might be necessary to stop playing for a few weeks to recover from these debilitating injuries and there are also ice treatments, massage, ultrasonics and laser treatments which can help more serious cases. Most sports and leisure centres will usually have at least one table tennis table and the relevant equipment which you can book out for a session if you and your friends want to take the sport up and, if you intend to get serious about the sport, England, Scotland, Ireland and Wales along with many counties have their own federations and have websites which will be able to direct you to a dedicated club in your area.